Harmful algal blooms expected to be lower this year in Lake Erie than in 2015. The National Oceanic & Atmospheric Administration (NOAA) and its research partners predict that western Lake Erie will experience a less-severe bloom than the record-setting one experienced last year during the harmful algal bloom season, the agency said July 7. The outlook reflects less discharge from the Maumee River and a return to an average nutrient runoff into the lake, NOAA said. This year’s bloom is expected to first appear in late July and increase in August in the far western basin of Lake Erie. The location and effects will depend on prevailing winds. “The need to reduce phosphorus and other nutrients from fertilizer, manure and sewage remains,” said Chris Winslow, interim director of the Ohio Sea Grant College Program. Farmers are already working toward that goal, said Jay Martin, ecological engineer in The Ohio State University’s College of Food, Agricultural & Environmental Sciences. According to a recent study co-authored by Martin, if farmers apply agricultural best management practices on half of the cropland in the Maumee River watershed, the amount of total phosphorus and dissolved reactive phosphorus leaving the watershed would drop by 40% in an average rainfall year, which is the amount decided in the 2012 Great Lakes Water Quality Agreement between the U.S. and Canada. Those agricultural best management practices include subsurface application of phosphorus; using cereal rye cover crops in the winters without wheat, and including medium-quality buffers on 50% of high-phosphorus-loss cropland, Martin said. To that end, Martin is leading a new two-year project funded by the Ohio Department of Education’s Harmful Algal Bloom Research Initiative. The effort seeks to continue to analyze management plans with improved watershed models and estimate the impact of climate change. Project partners include the University of Toledo and Ohio’s Central State University in Wilberforce. This year’s algal bloom forecast included a Maumee River flow forecast model that increases NOAA’s confidence in the seasonal outlook and may allow the agency to produce a specific harmful algal bloom forecast even earlier in the season, Russell Callender, assistant administrator for NOAA’s National Ocean Service, noted. The 2016 bloom is expected to measure 5.5 on the severity index but could range anywhere between 3.0 and 7.0. The forecast is similar to conditions last seen from 2008 to 2010, although the bloom may be as small as that seen in the relatively mild year of 2004. The seasonal outlook uses models that translate spring nutrient loading into predicted algal blooms. After three years with wet springs, this spring has had more typical rainfall, leading to more normal discharge from the Maumee River. 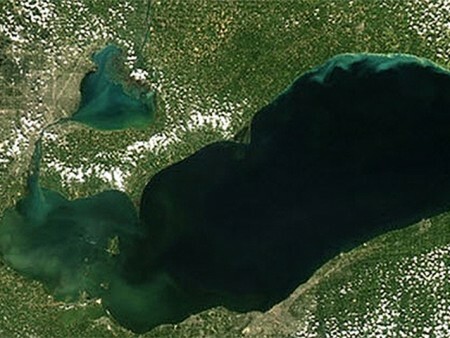 As a result, there is less phosphorus entering Lake Erie and fewer nutrients to fuel a bloom. “With a return to average spring discharge and much lower river flow in June than in recent years, the western basin should look better. However, the phosphorus inputs to the lake are still high enough to support bloom development,” said Richard Stumpf, the NOAA National Centers for Coastal Ocean Science’s lead for the Lake Erie bloom forecast.